22 year-old female patient wanted to soften out her bridge and lift the tip slightly. This was able to be done with Juvederm XC. Non-surgical rhinoplasty with Juvederm. This patient wanted a straighter bridge and to fill in the dip above the tip of the nose. 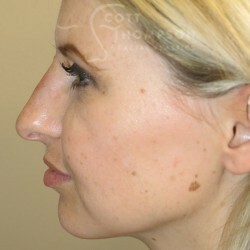 32 year-old female with non-surgical rhinoplasty from Scott Thompson, MD. Dr. Thompson often uses Juvederm or Radiesse for a non-surgical rhinoplasty.